Teeth are straight, slightly curved or wavy. The more teeth you have, the more hair you will remove. Remember that a 46T 6” blender won’t cut the same as a 46T 8” blender! Teeth have a ‘fishtail’ end. Chunkers are almost a full bladed scissor, except that the small space between the teeth allows some hair to be pushed out of the cutting blade – resulting in a smoother, more natural finish. Always buy the best pair you can afford! Cheaper flimsy/longer chunkers are more likely to cross. Blenders have a straight cutting blade and a notched tooth blade. They are used to ‘blend’ long hair into short hair, particularly around pattern & clipper lines. The more teeth a blender has, the more hair it will remove, and ultimately the smoother the blend – remember the length of the scissor will also impact the final cut. Depending on the steel and cut, blenders and chunkers can be easily caught. Convex sharpening allows the blades to cut smoothly because they have a thin cutting edge, this however, can be an issue when it comes to blenders and chunkers, as a slight nick while cutting (from a hair knot/fold or user pressure) can easily cause the delicate cutting edge to strike a tooth and be unusable until it is serviced. 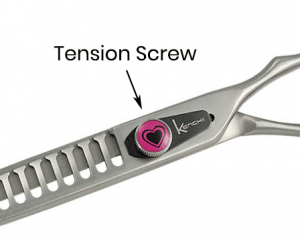 Tension – especially with a new scissor, it’s a good idea to open the blades and test the tension before you first use them. If the tension is too loose, the likelihood of the blades physically crossing even without being used on hair increases dramatically. If the tension is too tight, it will force too much pressure on the scissor alignment and can distort the balance, causing the convex blade to rub against the notched blade reducing its sharpness and durability. The potential to catch your blades will also increase as you’ll have to apply a greater force to close the scissor. 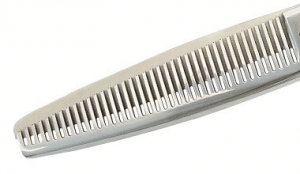 Familiarity – Practise using your scissor prior to grooming a dog to get the feeling of it cutting without hair resistance, this could help prevent the blades crossing and causing a ‘caught tooth’. As you become more familiar with how the scissor feels, you’ll develop a natural feel for the pressure needed and you’d know to stop if you sensed a difference in the cutting motion while grooming. 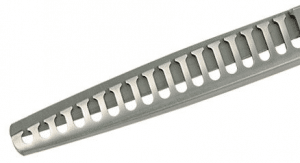 Hand Positioning – The most common cause of blade crossing is simply the way the scissor is held and used. If these are used like a regular shear with two blades the likely hood of a notched tooth getting caught is increased as these shears can be very unforgiving, especially longer length chunkers. Try placing your ring finger inside the bottom insert with the pinky resting on the finger rest and your middle and index finger on the (neck and shank) for support while your thumb is operating the shear from the upper insert. Don’t use after dropping – Check the scissor after dropping before using, as it could easily be out of line and just need taken apart and put back together (If dropped closed). If dropped while open, the impact of the blade on a notched tooth could be exaggerated and would require the shear to be serviced and re-sharpened, so if you see any indentations to the cutting blade, do not use as this could further affect the alignment of the shear. Not sure which scissor to buy? Check out our article Thinners, Blenders and Chunkers Explained for more information on which scissor is right for you!